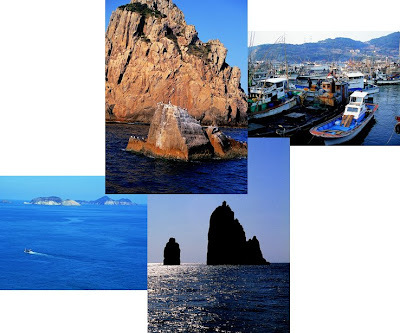 Baekdo is an island in Dadohae National Park and is located at 28 kilometers away from Geomundo Island. 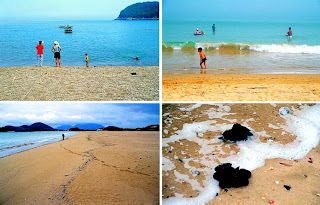 Baekdo is considered a counterpart of Hongdo Island and was nominated as the 7th famous place in the South Sea. Baekdo is an uninhabited island featuring sharp cliffs of gorgeous huge rocks that look like a grand palace which no human architect on the earth could ever build. Baekdo is divided into Sangbaekdo and Habaekdo. There's a rumor that says the name of the island is called Baekdo because it is derived from the Chinese character Baek, which means one hundred in number. Supposedly, the island is composed of 99 islets, just one short of a hundred. But in reality, the rumor is not true. No one can say definitely how many islets form Baekdo, because the number of islets changes according to the ebb and flow of the tide. In encyclopedias, the island is composed of 39 islets, but some people say the number is 24, while others insist the number is 67 when including large and small rocks that appear at low tide. Whatever the right number may be, their total area is as small as 0.62 square kilometers. During the Japanese colonial days, Japanese people changed the name of Sangbaekdo and Habaekdo, referring to Habaekdo as Sangbaekdo, as it is nearer to Japan where their emperor resides. And this mistake lasted for a long time even after the colonial days. But this mistake was corrected in 1990s due to the continuous request of the residents of nearby Geomundo Island, and many other people including the author of this article. As soon as you see Baekdo, you will be thrilled, as if you were being engulfed into a mysterious castle. The islets seem to have lots of legends, as typical of most famous places. In one legend, a prince of heaven was expelled from heaven to these islets. He fell in love with a princess of the sea and lived a romantic and happy life on the sea. As time passed, the king in heaven missed his son and sent his messengers to bring his son back from the sea. The messengers did not come back to heaven, but chose to remain at sea. The king sent more and more messengers to bring back his son, with the number of messengers eventually reaching a hundred. At last the king became very angry and made all his messengers and his son freeze as rocks, which became the Baekdo islets. Each islet has its own legend, too. 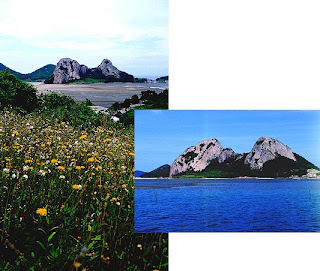 According to the many legends: the king of heaven sent a message to the Naru islet, two heavenly messenger brothers hid themselves at the Brother rock as they were scolded by the king, crops were stored at the Nojeok islet, Tanggeunyeo looks like hat used by a messenger from heaven, an eagle turned into the Eagle islet while it was trying to catch the prince's pet bird. All these legends are concerned with the islets of Sangbaekdo. A lighthouse run by solar energy is installed on the peak of Sangbaekdo, which is 155 meters above sea level. On both sides of the slope of the peak are steps to the lighthouse. It takes about 20 minutes on foot from the sea to the lighthouse, but these step roads have been closed to protect the natural environment. 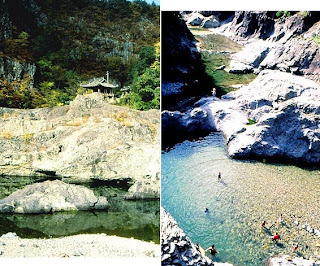 In Habaekdo, there is Seobang rock, which looks like a phallic symbol. According to the legends, the prince of heaven was punished by turning into this rock, and the princess of the sea was punished by becoming Gaksi rock, which looks like the genitalia of a woman. And there is Jewel rock, which was once the jewel box of the two lovers. Palace rock is the place where the prince used to live with his servants. Dokiyeo is the place where one of the heavenly messengers came from the heaven with an ax. Sinseon rock is the place where heavenly angels used to roam. Rocks in Baekdo look like human beings or animals. They look different whenever viewed from different angles. People cannot help but be amazed to see the mysterious shapes of the rocks with their fabulous legends that were created by the clever residents of nearby Geomundo Island. Residents of Geomundo believe in the legend that they will become rich if they pray at Jewel rock. What's more mysterious is the fact that no one has ever experienced a shipwreck at Baekdo. Before any storm comes, a mysterious loud sound comes from the Baekdo as an early warning to fishermen, and once they find shelter at Geomundo the storm would begin to roar without causing harm to any of the fishermen. More than 350 kinds of subtropical plants such as Neofinetia calcata, Orchis graminifolia, Juniperous Chinensis, day lily and Fatsia japonica thrive among the chasms of sharp cliffs. About 30 kinds of sea birds including the wren, Estern gray wagtail, cormorant, bush warbler, fairy pitt, wood pigeon, black-tailed gull, goldfinch, silvereye, titmouse, and Phylloscopus borealis live there. Baby birds learn how to fly from their parents near the cliffs along the seaside and their nests are placed in the many holes in the cliffs. 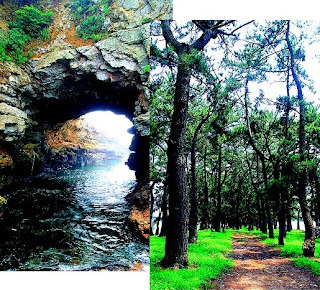 Baekdo is famous not only for its natural beauty but also because it is a paradise for animals and plants. All the tourists on tour boats love to view the island again and again on their way back from the wonderful islets. Uncontaminated natural attractions of the islets enchant the tourists for a long time. Mt. Hwangmae (1,108 meters above sea level) traverses Gahoe-myeon and Daebyeong-myeon Hapcheon-gun Gyeongnam and Chahwang-myeon Sancheong-gun. The first impression of the mountain is that it looks very rough and grandiose. The grotesque cliffs and huge rocks over the Youngam Temple looks oppressive, like a part of Mt. Seorak. However if you take the trail on the mountain you will find the way to be smooth and comfortable. The southeastern slope of the mountain is so flat that it was once used as a pasture. Following after Mt. Gaya, which features the famous Haein Temple, Mt. Hwangmae is called the "second best mountain in Hapcheon." As the rocks on the peak of the mountain look similar to Halmi flowers (Halmi means "grandmother" in Korean, and its other foreign names are pasqueflower, windflower and Pulsatilla koreana), the name of the mountain used to be 'Mt. Halmi' but was changed to Mt. Hwangmae later. There is a legend that its name was originated from Magohalmi. As Hwangmae Mountain stands conspicuously high above the other mountains nearby, it has many legends about its origin. On the southeastern slope of Mt. Hwangmae is Youngamsa Temple. Even though the temple is not large in its scale, it is a very attractive temple surrounded by great rocky walls. At the ancient site of Youngamsa Temple are several cultural treasures of national treasure class that reveal that the ancient temple was rather famous in the past. As the temple has no record about its founding, nobody knows when the temple was built, but the remains of old relics suggest the temple was built during the Unified Shilla Kingdom. The ancient Youngamsa Temple was nominated as historical site No. 131. It houses Geumdang Site, Seogeumdang Site, Jungmun Site and Three Storied Pagoda (Treasure No. 480), Twin Lion Stone Candle Holder (treasure No. 353) and Stone Guibu (Treasure No. 489). Various tile pieces made during the Unified Shilla Kingdom and Goryeo Kingdom and the Standing Golden Statue of Buddha were found there when an excavation was made in 1984. After the common azaleas (Jindallae) disappear in early spring, royal azaleas (Cheoljjuk) begin to bloom. The royal azaleas are similar to common azaleas but their petals are thicker and they bloom in greater numbers, covering their boughs before their leaves come out. As royal azaleas have contain poison, the flowers are not edible. Therefore common azaleas, which are edible, are called true flowers while inedible royal azaleas are called dog flowers. Royal azaleas can be seen on any mountain all over the country but only a few mountains have clusters of royal azaleas covering a wide area. Mt. Hwangmae is one of the few mountains that are famous for sweeping expanses of royal azalea blossoms. Royal azaleas found in the middle part of the Korean peninsula feature a light pink color, but those flowers in the southern part have a strong red color. The royal azaleas on Mt. Hwangmae have a deep red color. 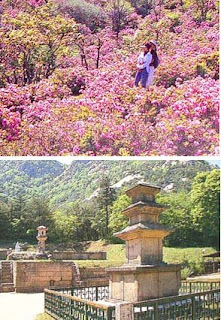 A wide field of royal azalea clusters stretches from the southern part of Dunnaeri pasture in Hwangmaepeyongjeon to the Youngamsa Temple. As you can command a view of the field very easily from the mountain trail, the red waves of royal azalea blossoms look very impressive. You can reach the peak of the mountain after walking about 40 minutes from the pasture, and you can enjoy a mountainous vista of Gyeongnam province that includes Mt. Jiri and many other high mountains. Hapcheon Lake on the northern part of the mountain makes the scenery very attractive with its cool atmosphere. Not far from Mt. 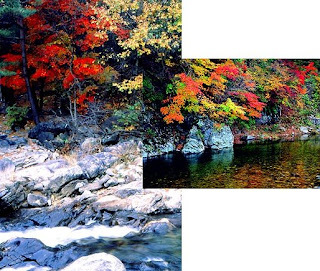 Hwangmae can be found in the secret charms of Hwanggye Fall in Hwanggye-ri Yongju-myeon. 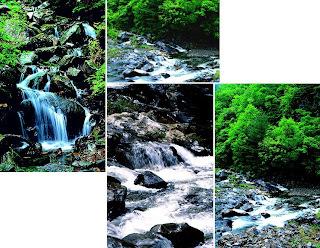 Hwanggye Fall features a two-stage waterfall, with the stream originating from Mt. Heobyeong (682 meters above sea level). The first fall starts about 20 meters high on a steep cliff and the cascade gushes cool water abundantly into the valley. It then forms another fall 10 meters high on its way down into the valley, forming several smaller cascades along the way. Hwanggye Fall has its own special attraction. 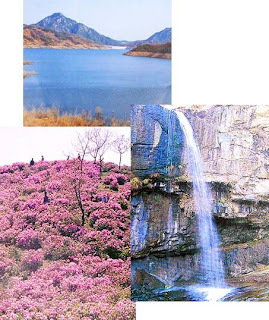 Your spring tour will become much enjoyable if you drive along Hapcheon Lake after looking around Mt. Hwangmae and Hwanggye Fall. Hapcheon Lake is a wide artificial lake that was formed by Haocheon Dam, which was constructed in December 1988. The dam is 96 meters high and 472 meters long. Forty kilometers long, the Hapcheon Lake drive is not just a simple path around the lake but is a steep course that eventually leads into the mountains, allowing drivers to enjoy the various surrounding attractions.